The iFFALCON K2A has size on its side especially when you consider the price. It has good picture quality performance, but other flagships outperform it. 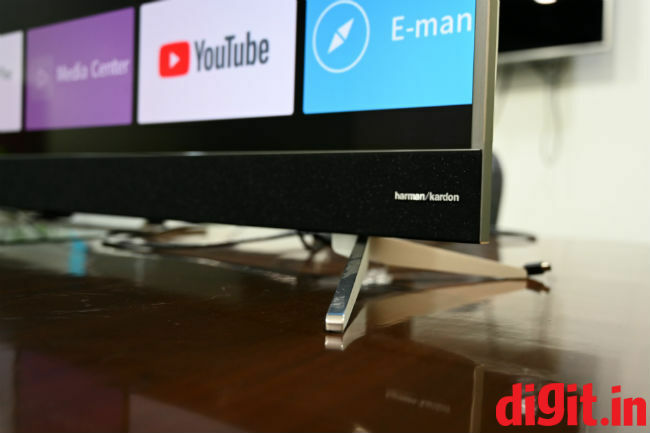 It has good sound from the Harman Kardon branded speakers and it has a functional build which is important at this size. The option of 2 remote controls in the box is welcome. You can consider this TV if size is something that is absolutely important for you. But if you want performance over size, there are other options in the market to consider. 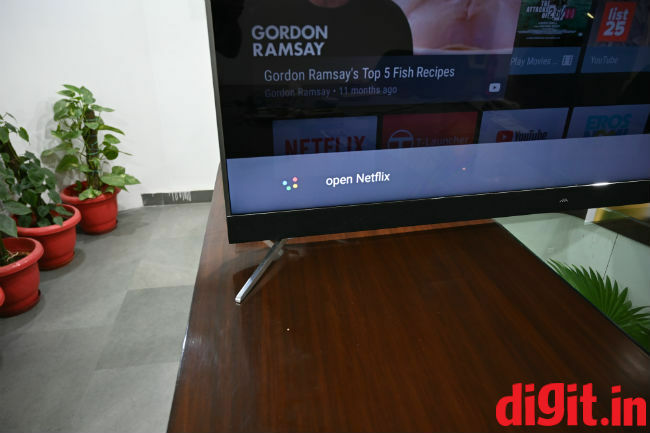 Most of the flagship TVs we have reviewed are 55-inch in size. We have seen some 65-inch TVs and a 100-inch projector. However, we haven’t had a 75-inch TV in our test labs in a long time. So, it was no surprise that almost everyone in office lined up for a glimpse at what can be described as a massive TV. The TV is so big and heavy, that it nearly bent one of our tables making us question the quality of furniture in our office. 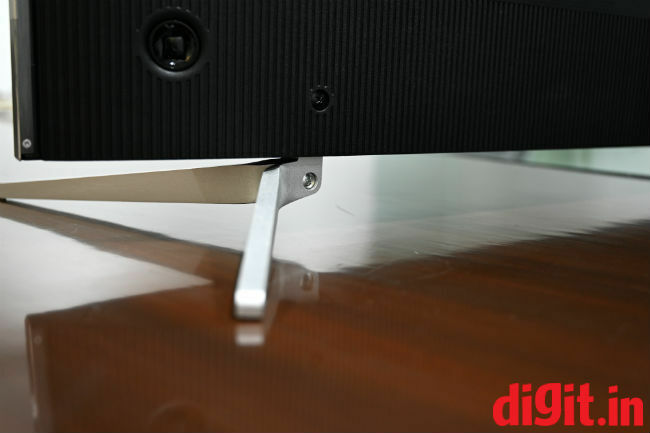 Having said that and securing the TV on a bigger and sturdier table, we got to reviewing the TV. Know, that for a budget of Rs 1,50,000 you can get the LG OLED C8 TV and the Panasonic FX800D. but for Rs 1,50,000 approx., you get the 55-inch variant of the TVs. Does it make sense to invest in size over performance? Just a note. The 55-inch LG C8 has an MRP of Rs 224990. But it sells on Amazon.in for Rs. 1,55,000 approx. Considering the size of the TV, it has to be well built and that’s what it is. From the two feet holding the TV in place to the bezels surrounding the TV. There is no glass border and the TV isn’t the slimmest we’ve seen and that’s fine as the TV needs to be sturdy considering its size. We repositioned the TV in our office a bunch of times and each time I saw the table top stand hold the TV in place without bending or flexing, which is impressive. One thing is that with its stand the TV weighs about 33 kgs which is a mere 3 kgs more than the 55-inch Sony A9F. The Sony TV in question here is 55-inches in size and was considerably heavy for its form factor. Despite weighing a little more than a 55-inch flagship TV, it is the size of the iFFALCON which is quite commanding. Overall, the TV is well built and even though I think you should place it on a table top, the TV can be wall mounted. Coming to the connectivity options, they are all neatly laid out on the right side of the TV. You have 2 USB ports, 3 HDMI ports, a LAN port, Antenna port, SPDIF out, AV in and headphones out. Since most flagship TVs at this price have 4 HDMI ports, some of you may miss the 4th port. 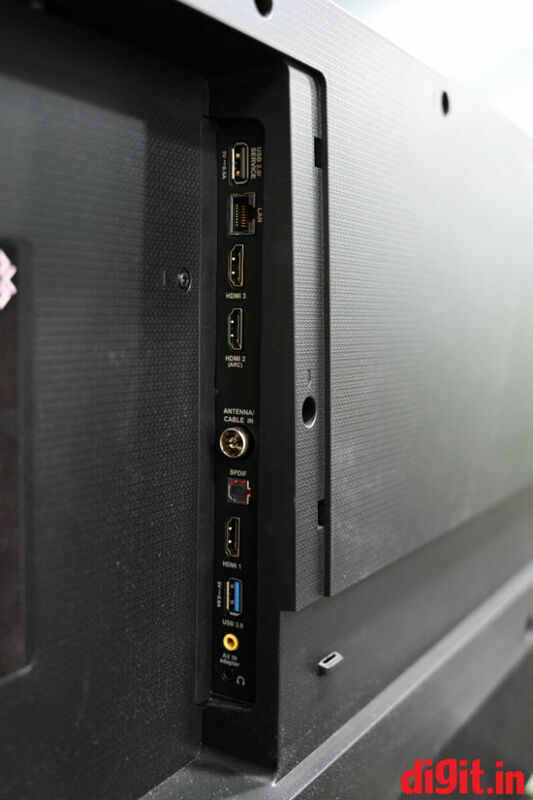 One of the three HDMI ports is ARC which is nice. The ports are neatly laid out even if they aren’t in order. The lack of order is helpful as you may have devices like the Fire TV stick which need more space and can be used with the HDMI port that lies secluded towards the bottom. 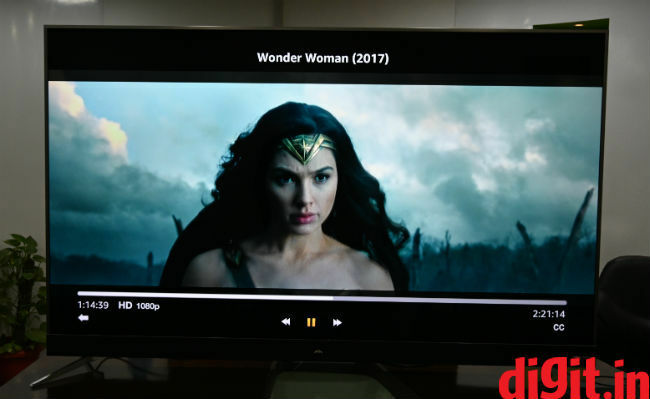 The TCL iFFALCXON K2A 75-inch TV has a resolution of 4K along with support for HDR 10 but does not support Dolby Vision. 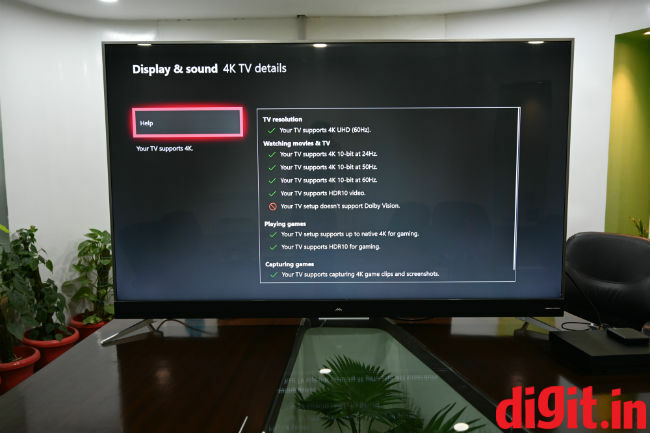 We will look at the performance of the TV individually in our various sections before comparing it with other flagship TVs in its price range. One thing to keep in mind is that the standard and movie settings get the job done for most of the content you will watch. Just remember to enable game mode from the advanced settings when you decide to play games on the TV. The TV has a native Netflix app and access to the Play Store since it works on Android TV. However, there is no Prime Videos available. We saw content on Netflix and YouTube via the built-in apps and consumed content played through our Xbox One X which has Prime Videos in addition to the two services. The content looks crisp however lacks vibrancy found on other 4K panels we have tested like the Panasonic FX800D. When watching HDR content, the panel does take the brightness and contrast to 100 percent and that is good. 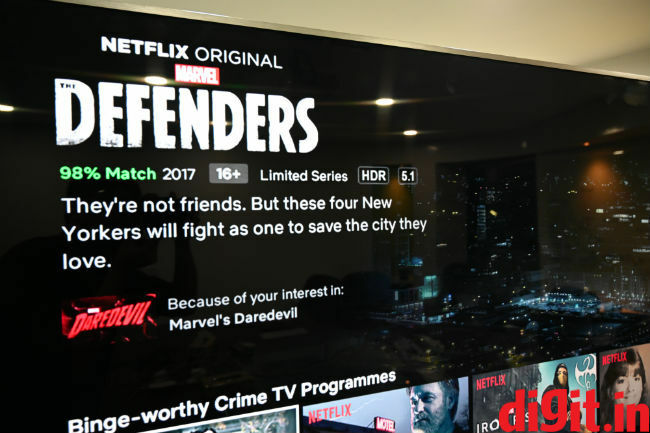 It makes the content viewable in a well-lit room and when something dark appears on screen (like the Netflix Daredevil Season 2 episode 3 fight scene), you do enjoy it. The downside to this is that the black levels aren’t the best we have seen, and this is not only when compared to OLED TVs but other LED TVs as well. We played our standard slew of content from Netflix and Prime Videos and all the content looked crisp retaining details, but I wish the content looked more vibrant. To explain this in detail, when you see Star Trek Discovery, the sequence that takes place in the cockpit of the ship in episode 1 the colour blue, though accurate, looks a little muted. You can change the settings to make it more vibrant, but it isn’t the same that we have seen on other TVs. Credit to the TV, considering its size, the TV has a uniform distribution of colours. Sure, there are times when you will see some banding here and there, but the overall uniformity is good. Overall, 4K movies and TV shows from streaming services look good but the HDR implementation with colours could have been better. Using these same streaming services, we saw some 1080p content on the TV and it looked as good as some of the 4K content when it comes to clarity which is nice. A movie like John Wick which has lots of reds, blues and blacks looks clear and there is uniformity in the distribution of blacks at various points on the screen. 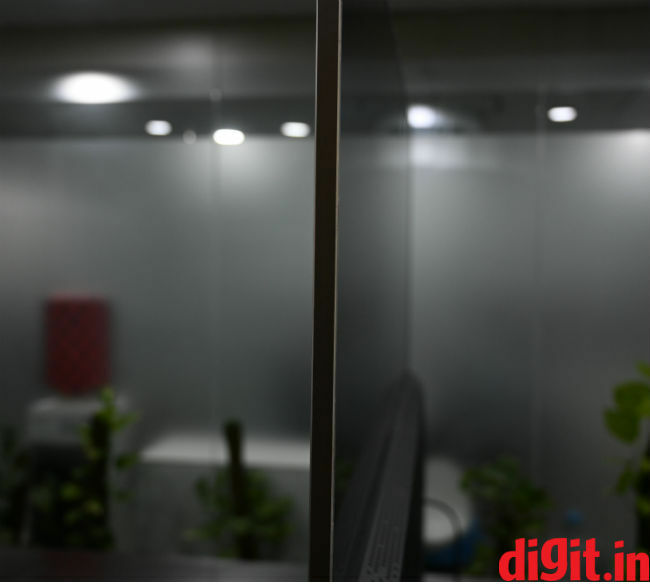 The blacks aren’t very deep, something you will notice when watching the TV in a completely dark room, but when there is natural light around, you can see elements in the dark on the screen. Shows in brightly lit situations like Young Sheldon, don’t have any problems as they are inherently bright with nice colours making the show enjoyable on the TV. For gaming we played some Forza Horizon 4 and Doom on the TV. Forza Horizon 4 is a treat on the behemoth TV mostly because of its size. It gives you the feeling of being in the car especially when you play using the drivers point of view. This is one game where the HDR representation looks good as well because you can see the details in the tires when the car is in a bright spot on the screen which is how it should be. The rest of the game, be it the Audi TT and Bugatti we drove in to the countryside littered with trees and other cars made the game an immersive experience. On the other hand, we struggled to get the perfect view in a game like Doom. Mars is an orange planet and the orange colour that looked off, more like oversaturated when outdoors. Since Doom is a game that has sequences both outdoors and indoors, the indoor sequences looked fine with well lit corridors, desolation all around and a feeling of loneliness being delivered quite well. It was outdoors that the saturation was too high, and it took a lot of tweaking before we could get it to an acceptable level. Doom is a game that exploits 4K on the Xbox One X but doesn’t support HDR. To try and tinker with the settings, we even switched off HDMI 2.0 on the TV to see if it affects the saturation and the effect though visible didn’t correct the colours. Baring Doom, games like Forza, Grip, Tomb Raider and more were a treat to play on this TV. 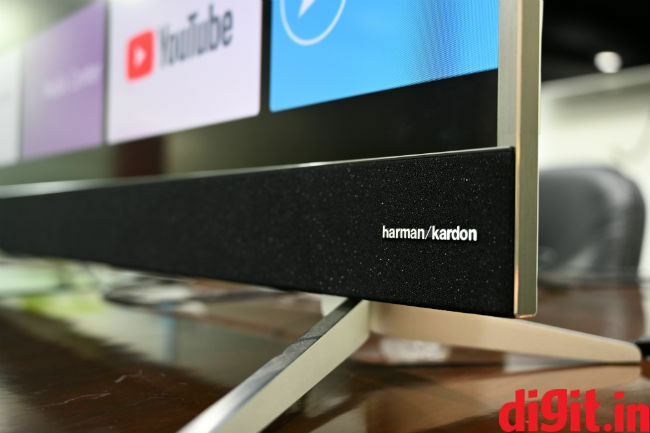 The TV touts Harman Kardon speakers that rests like a soundbar below the TV. The speakers on the TV has two drivers on either side and overall, they sound good. Music with vocals in them are clear, movie dialogues are audible and there is a clear separation between the background score and dialogue. I think it also helps that the speakers are directed towards you and not down firing speakers. In a show like Young Sheldon where the dialogues are key, they are well pronounced and clear. But the speakers aren’t perfect. They lack bass to begin with. One more thing to note, and this is probably because of the size of the TV as well, is that the voice sounds like it is coming from one side or the other of the TV. If a character moves even ever so slightly off center, the sound shifts completely to the side speakers, with the center channel completely missing in audio delivery. This probably could have been eliminated if there were one speaker driver in the centre of the soundbar. This is a really small thing and probably the only reason I noticed it is because the TV is so big, and I was sitting 7-feet away right in the centre. A great thing about the iFFALCON TV is that it comes with 2 remote controls in the box. One is a traditional remote control with the standard set of number pad, volume and channel controls, a Netflix button and more. The only problem with this slender TV remote is that the mute button is at the top right corner. Even though this is a traditional placement the remote control is so long that can be an effort to reach it. 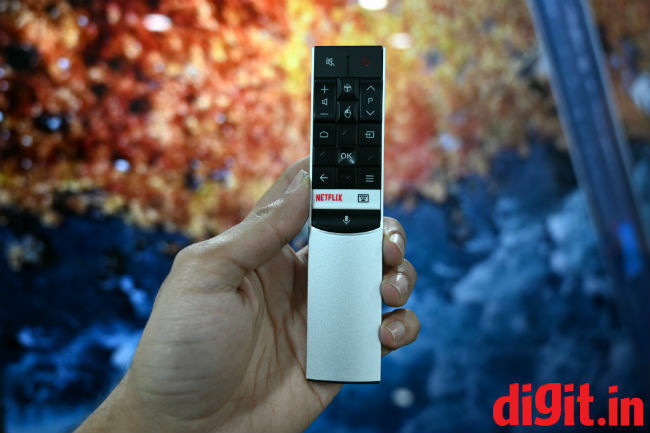 The second remote is more like a magic remote with minimalistic controls including volume, channel change, Netflix, settings, mouse functionality. 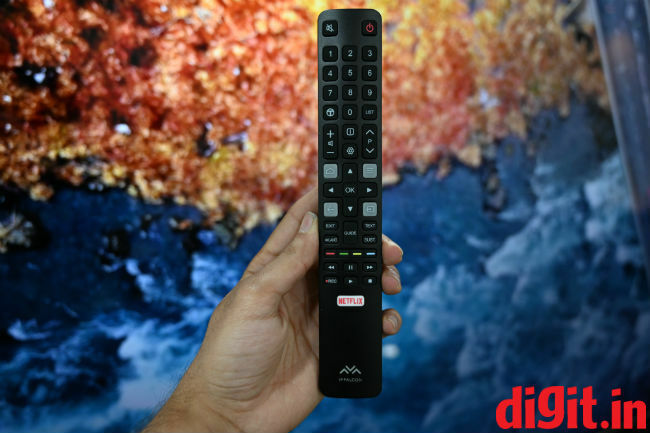 It is a more convenient remote to use and since the TV runs on the TV version of Android, you can use the smaller remote to navigate with ease. 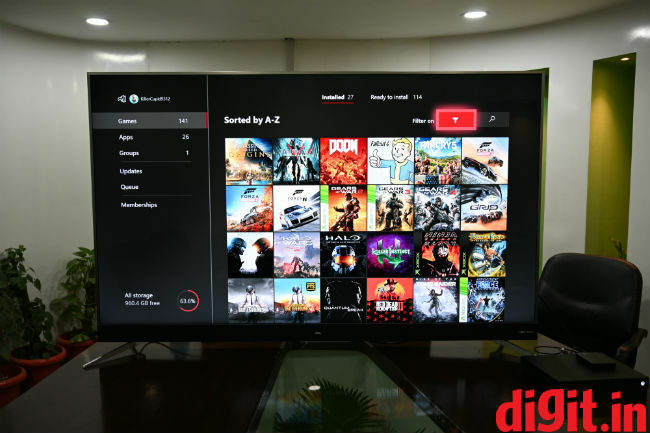 The iFFALCON K2A TV runs on Android TV version 7 out of the box and as an OS it has the same pros and cons found on Sony TVs running the same OS. It is slow to get to the menus especially when you are watching HDR content. 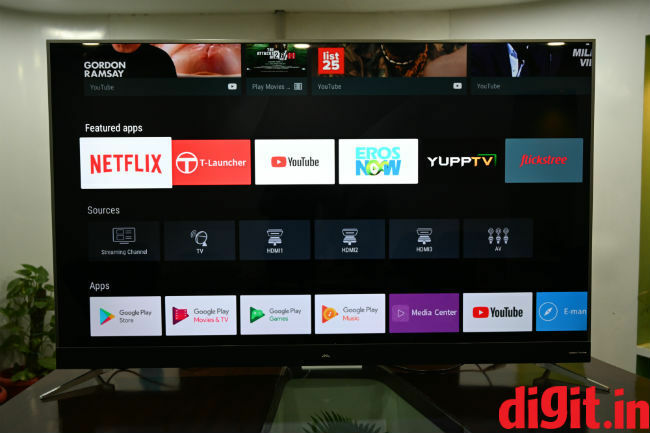 It is convenient to use when it works and the presence of the play store means you have access to a large library of apps designed to work with a TV. On the downside, there is no Prime Videos in the Play store and the voice controls are buggy. Yes, the remote control has a dedicated voice button and you can say things like “Open Netflix” and it will work. There are times when I would give a voice command and wait for almost 20 seconds before trying again and each time nothing would happen. Essentially the voice control is a hit or miss. When it works, it works and when it doesn’t, its annoying. 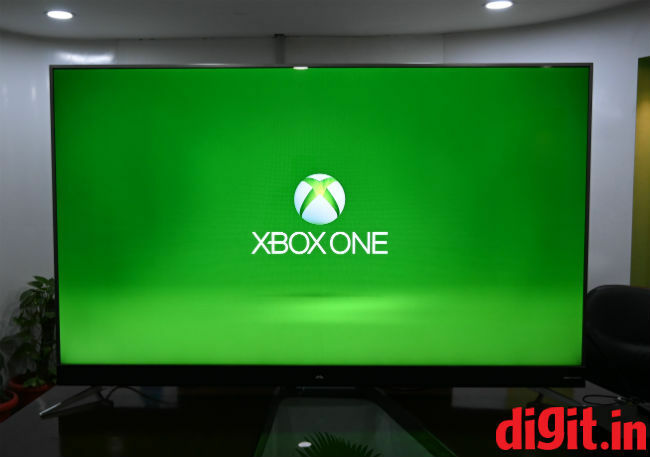 If you are looking for a TV for Rs 1,50,000 you have quite a few flagship TVs to choose from. But we will only talk about the ones that we have reviewed. If picture quality is absolutely important to you and you don’t mind a smaller TV that you can watch in a dark room, then consider the LG C8 55-inch. At about the same price, it has far superior picture quality. On the other hand, if you will watch TV is a decently lit room and don’t mind a smaller size, then you can consider the Panasonic FX800D. The TV has a fantastic panel with great HDR performance and some good upscaling as well. But, if size matters and you want a behemoth of a TV and don’t mind compromising a little on the picture quality, then you can consider the iFFALCON K2A. It is for those that want a large TV in their house. The TV has good picture quality for most of the content you will consume and works well for gaming as well. Its HDR performance isn’t as good as the LG or the Panasonic we have spoken about here but its overall performance for watching movies, TV shows and gaming is a treat. The iFFALCON TV has a good remote control, easy to use UI and settings and the sheer size will ensure you sell movie tickets to your friends every Friday night.